Along with the Bubble Bath Petals from Fresh Organics, I also received a jar of their Better Body Butter from Organic Bath Co. 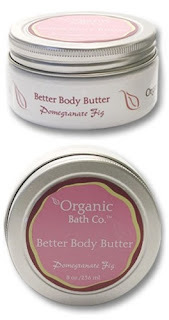 This Pomegranate Fig Better Body Butter was AWESOME!!! I have tried many many body butters and this is by far one of the best I have used. Made with shea butter, jojoba and other protective, rich oils it goes on very silky smooth with a light scent. I even put it on my dry patches on my arms and they cleared up and stayed good as long as I was using this butter on them everyday. My jar is getting to the end so I need to get some more. This hypoallergenic, paraben free, cruelty free, mineral oil/petroleum free body butter is excellent for these dry winter months. A great gift for anybody. Better Body Butter retails for $12.99. (on sale now for $9.99) Go to www.freshorganicliving.com and see other products for the whole family.